Automatic Window Frame Sealing Machine,Window Automatic Sealing Robot,Window Frame Automatic Sealing Robot,Window Automatic Sealing Machine,Window Frame Automatic Sealing Robot,Automatic Window Sealing Machine,Automatic Window Sealing Machine,Window Sealing Robot. 1.Applicable to large-scale production of doors, windows and curtain walls, reducing labor intensity and improving production efficiency. 2.Adopting bicomponent sealant supplying system to shorten curing time, avoid worker waiting and increase production efficiency by 6-10 times. 3.Adopting internationally-advanced mixing system to make sealants be mixed accurately and evenly and have high liquidity.Window Automatic Sealing Robot,Window Frame Automatic Sealing Robot,Window Automatic Sealing Machine,Window Frame Automatic Sealing Machine,Window Single Component Sealing Machine. 4.Japan Omron PLC adopted results in high computing speed and precision. 5.Servo motor control system adopted results in high driving precision. 6.Key parts made of special materials by standardized production have high precision and prolong service life of machine. 7.The working table of high-quality aluminum structure reduces friction, protects window frame and facilitate scale production and installation. 8.Touch screen as operating interface makes operation easy and convenient. 1. One year guarantee period for whole machine, except the wearing spare parts, such as the saw blade and drill bits. 2. 24 hours technical support by E-mails. 3. 24 hours calling service. 4. Oversea door-to-door service available. 5. User manual and detailed video/CD.Window Frame Automatic Sealing Robot,Automatic Window Sealing Machine,Automatic Window Sealing Machine,Window Sealing Robot,Automatic Window Frame Sealing Robot,Automatic Window Sealing Robot,Automatic Window Frame Sealing Machine. Window Frame Single Component Sealing Machine,Automatic Window Single Component Sealing Machine,Automatic Window Frame Single Component Sealing Machine,Window Single Component Automatic Sealing Machine. The normal package is wooden box(Size: L*W*H). If export to european countries,the wooden box will be fumigated.If container is too tigher,we will use pe film for packing or pack it according to customers special request.Window Frame Single Component Automatic Sealing Machine,Window Single Component Sealing Robot,Window Frame Single Component Sealing Robot,Window Single Component Automatic Sealing Robot. 1.Integrated frame design in order to minimize the size of complete machine,saving installation space. 2.Automatic sealing discharging function to avoid the pipe blockage cased by human factors. 3.Special design for checking the depth of sealing in order to control the spread of sealing automatically. 4.Two sets of sealing systems can work completely independent(including mixing glue machine). One key switch for changing two component sealant.Window Frame Single Component Automatic Sealing Robot,Automatic Window Single Component Sealing Robot,Automatic Window Frame Single Component Sealing Robot. 5.In the condition of neatly glass edge and no dislocation,the sealing can be without seam,enrich the corner,quadrilateral smooth surface,no need to repair the corner. 6.Transfer integral V type rubber belt,make the glass transmission smooth and accurate positioning,can realize the processing of ultra small size of glass. 7.Convenient operation system.Automatic Window Sealing Machine,Window Sealing Robot,Automatic Window Frame Sealing Robot,Automatic Window Sealing Robot,Automatic Window Frame Sealing Machine,Window Automatic Sealing Robot,Window Frame Automatic Sealing Robot,Window Automatic Sealing Machine. SAINT BEST GROUP is a member of China Construction Metal Structure Association of Ministry of Construction. Also with the honor of “China Famous Products”,we are China TOP manufacturer of Aluminum&UPVC Window and Door Processing Machines,and Insulating Glass Processing Machines, with an annual sales of USD2,000,000 from 2012.Window Frame Automatic Sealing Machine,Window Single Component Sealing Machine,Window Frame Single Component Sealing Machine,Automatic Window Single Component Sealing Machine,Automatic Window Frame Single Component Sealing Machine,Window Single Component Automatic Sealing Machine. Thanks to your trusts and full supports,Saint Best Group has become a large-scale production and development in the past 12 years.Dedicated to strict quality control and thoughtful customer service,we have built long-term relationship with customers in Asia, South Africa and north of America.We also welcome OEM and ODM orders.Window Frame Single Component Automatic Sealing Machine,Window Single Component Sealing Robot,Window Frame Single Component Sealing Robot,Window Single Component Automatic Sealing Robot,Window Frame Single Component Automatic Sealing Robot. 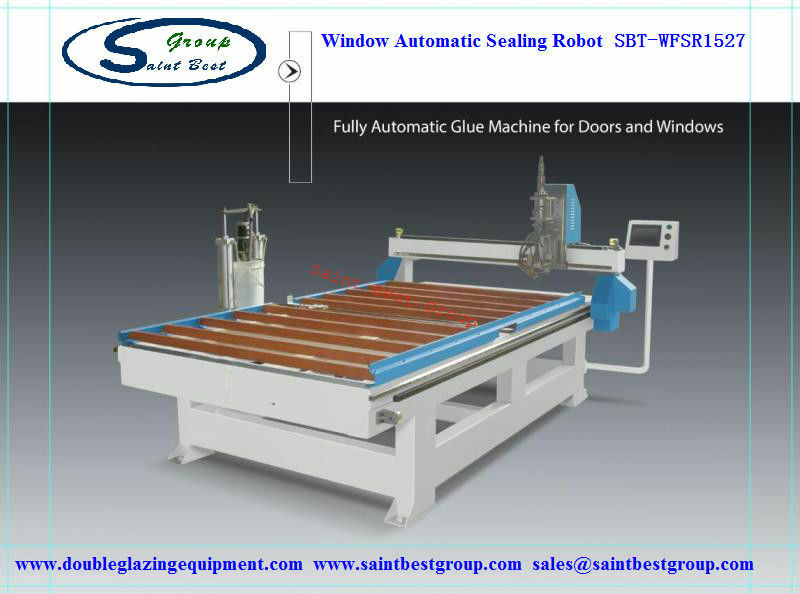 2.Saint Best machine with high precision and high reputation is the most reliable goods you can choose.Automatic Window Single Component Sealing Robot,Automatic Window Frame Single Component Sealing Robot,Automatic Window Frame Sealing Machine,Window Automatic Sealing Robot,Window Frame Automatic Sealing Robot,Window Automatic Sealing Machine,Window Frame Automatic Sealing Machine. 5.Saint Best Group has international tech service office and provides 24 hours online service and tech support for customers.Window Single Component Sealing Machine,Window Frame Single Component Sealing Machine,Automatic Window Single Component Sealing Machine,Automatic Window Frame Single Component Sealing Machine,Window Single Component Automatic Sealing Machine,Window Frame Single Component Automatic Sealing Machine. We always looking for long term cooperation, not one time deal.Automatic Window Sealing Machine,Window Sealing Robot,Automatic Window Frame Sealing Robot,Automatic Window Sealing Robot,Automatic Window Frame Sealing Machine,Window Automatic Sealing Robot,Window Frame Automatic Sealing Robot,Window Automatic Sealing Machine,Window Frame Automatic Sealing Machine. 6. If I want to visit your factory, where is the nearest international airport ? Jinan airport is the nearest international airport in Shandong province.